Complex brain aneurysms of cerebral arteries with high risk of rupture require careful planning of endovascular treatment. 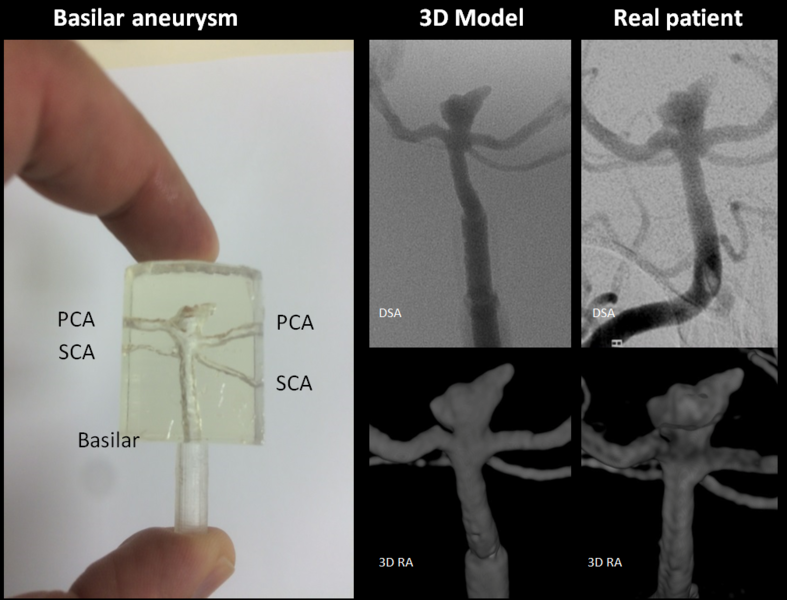 Our group specializes in stereolithographic 3D printing of high quality transparent models of cerebral vasculature and brain aneurysms based on real patient angiographic datasets. 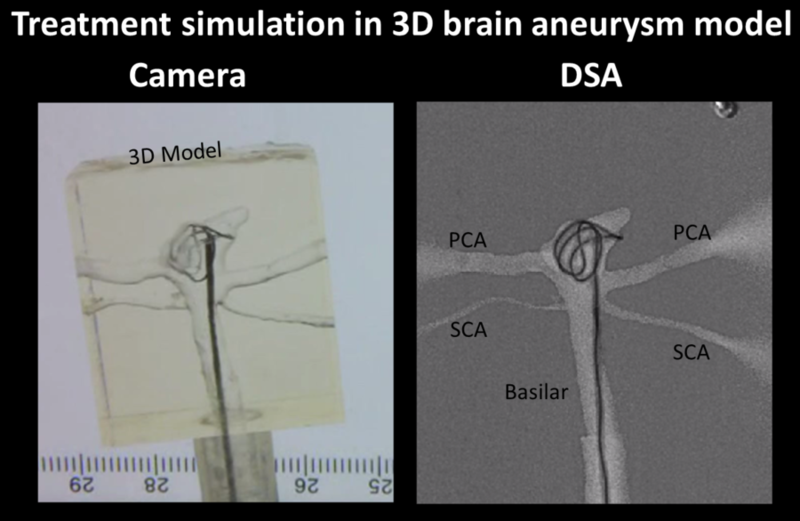 The 3D models are implemented in a flow system (FLOWMODDA) that can be used on the lab bench for direct visual device placement or installed in a digital subtraction angiography catheter lab. Prospective patient specific treatment planning: Embolization of complex brain aneurysms with stent remodeling or flow divertes can be simulated to increase confidence of interventionalist. Teaching and continuing practice in workshops: Repetitive procedure training in 3D models of complex aneurysm to save lab animals. In-vitro Device Tests: Device deployment (e.g. coils, flow diverters, stents) in variable anatomic models based on a library of case specific aneurysms. 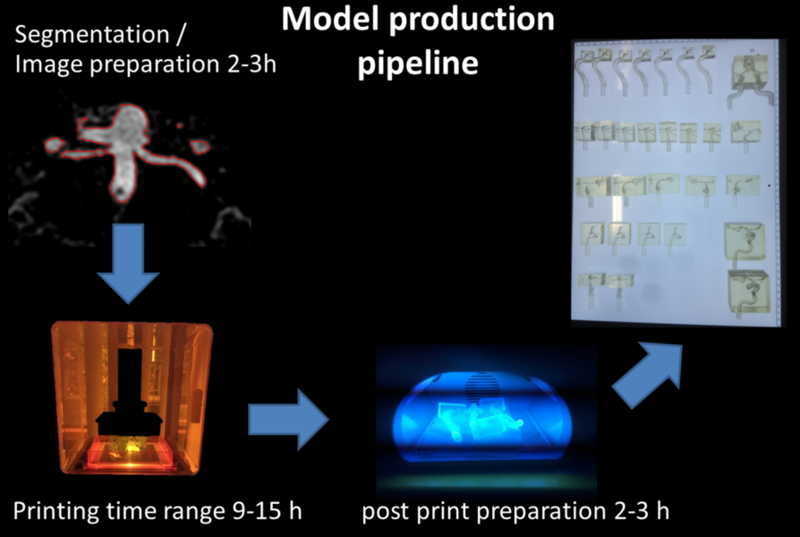 In-vitro fluid dynamic measurements: High precision flow models for optimization of angiographic methods (MRA, CTA) or validation of computational models for fluid dynamic models using particle image velocimetry. Frölich AM, Spallek J, Brehmer L, Buhk JH, Krause D, Fiehler J, Kemmling A. 3D Printing of Intracranial Aneurysms Using Fused Deposition Modeling Offers Highly Accurate Replications. AJNR Am J Neuroradiol. 2016 Jan;37(1):120-4. doi: 10.3174/ajnr.A4486. Epub 2015 Aug 20.